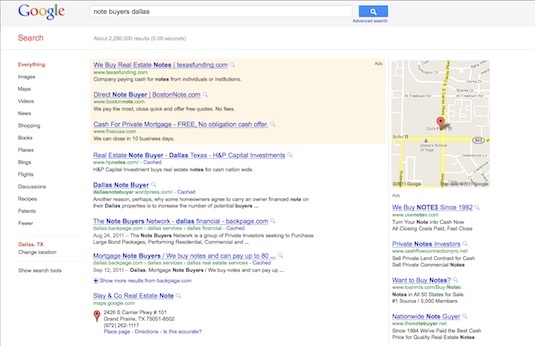 3 Tips for getting your mortgage note business found online using Google Places and Local Maps. Chances are you’re more likely to use it as a booster seat or doorstop than to look up a business. Online search has quickly replaced the yellow pages. In fact many cities like Seattle are looking at requiring opt-outs for phone book delivery. they’ve just made it easier for small businesses with Google Places. Formerly known as local maps, a Google Places page provides a free listing containing contact information for your business. Google uses this information to serve up results for local search and place you as a “pin” on their maps. In fact it’s not unusual to see a Google Places page showing higher in the rankings than a company’s own website. The first step is to see if your business already has a Google Places listing. Just open a Google search bar and type in your business name, city, and state. If you don’t see it listed with a red map pin next to it then go to the left side bar and select “More” and then “Places”. If you find your listing just click the link to view the actual “Place Page”. To the right and above the map will be “Edit this place” followed by either “Owner Verified Listing” or “Business Owner?” in blue text. 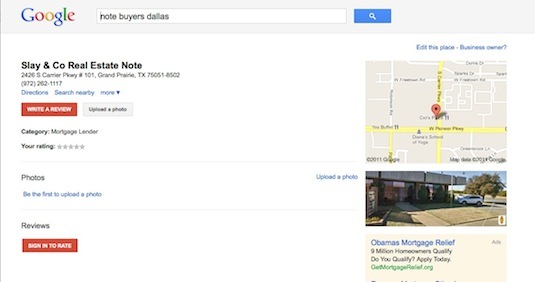 The two screen shots show an example of these pages using the term Note Buyers Dallas. If you already show as Owner Verified you can skip the next step and move to optimizing your listing. If you have a listing that says “Business Owner?” you need to verify your listing. Can’t find your company listed at all? That’s OK, you will just need to start the next step from scratch. In order to get optimum results you will want to verify your business. Google wants to be sure the listing information is accurate and that only the actual business owner is editing the information. To verify or create a new listing sign into the Google Places area by using an existing account (like Gmail). If you don’t have a Google Account or want a separate business account just follow the steps to create a new one. You have the chance to preview and change your listing. When you are satisfied choose to verify your listing by phone or mail. You will receive a PIN that must be entered when you log back in to finish the verification process. Complete the full listing – Make sure you’ve utilized all areas to their full extent – like adding coupon offers, selecting 5 categories, and uploading 10 photos and 5 videos. Utilize keywords – Incorporate the keywords or phrases a person would use to find your services in the descriptions. Follow the Quality Guidelines – There are some “do’s and don’ts” you will want to follow as published by Google. Build Citations – Obtain listings from other online directories like super pages, yelp, yahoo local, yellow pages, city search, and others. Make sure the NAP (Name, Address, Phone Numbers) all match for best results. Encourage Reviews – User reviews will help build your trust factor. There are very few note buyers that have claimed, verified, and optimized their listing. That means this is your chance to get in on the ground floor for local search results before the word gets out. You will find it is much faster to achieve page one of local search with a well optimized Places Page than the time it takes to see results implementing SEO strategies on your website for buying mortgage notes. Don’t get left behind…claim the free and easy Places Page for your note business today! If you want more information you can visit the Google Places User Guide or login to the Finding Cash Flow Notes Training area. Just this week we posted a new video that shows a step-by-step walk through. We also explain how to handle the address issue for home based businesses along with tips for building citations and enhancing with photos, videos, and free offers. Watch us as we create an optimized note business listing using a live example! I was looking up creating listing for internet-base businesses or micro businesses, that are often one man shows, and don’t have a commercial business address. Dunno how your post showed. Anyway, just want to let you know the “booster seat” bit got me laugh. That’s exactly what I do. Forgot to say this – your post was pretty good. I did read it.